I was at a loss for words. What was this? My handsome Italian server had placed a heaping plate of black spaghetti in front of me, sprinkled with bits of calamari, tomatoes and zucchini strips. Colorful, to say the least. In all honesty, appetizing? I wasn’t sure. Just then a soft breeze came through the open window of the exotic oceanfront restaurant, La Terazza di Mimi, on Ventotene Island, one of the Pontine islands west of Rome. I breathed in deeply and glanced around the table at my friends who had received the same pasta dish. Since we were there to experience local cuisine chosen for us by the staff, I asked my server what the dish was called. “Spaghetti al nero di seppia” (spaghetti with squid ink). “È molto eccellente,” he replied with a smile. I must confess, at the end of the meal, that the server was right. It was surprisingly delicious. The squid ink sauce was smooth, delicate and just a little salty. Would I order a plate of Spaghetti al nero di seppia again? Absolutely! What I have learned since is that pasta with squid ink is one of the most common recipes of the Italian coastal regions. Believed to have originated in Sicily, you can find various versions of it in nearly every region in Italy. 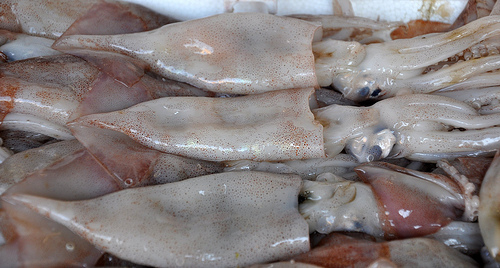 Cuttlefish, or squid, has always been a favorite food for fishermen’s families and nothing goes to waste, including the ink. The squid produces the ink as a defense mechanism, which it releases as a dark cloudy liquid to confuse a predator. 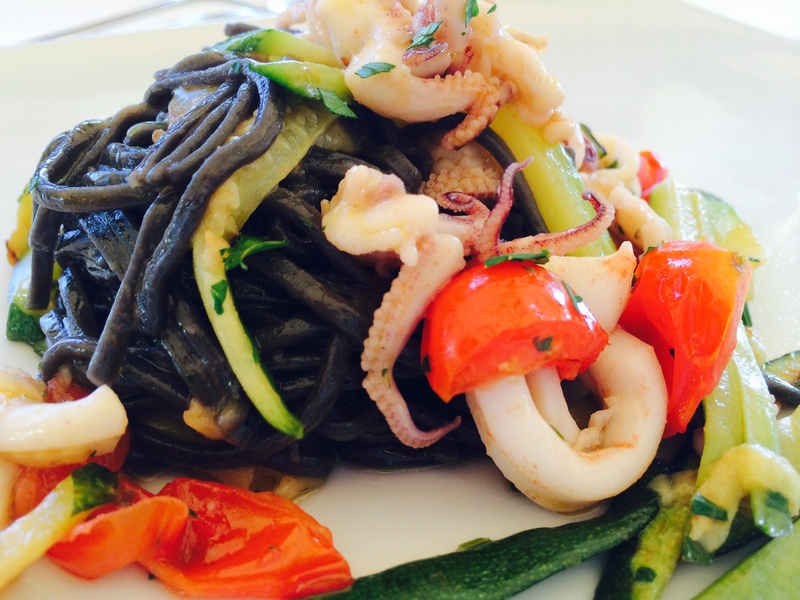 Found to be rich in antioxidants and iron, squid ink is a nutritious little commodity. “… researchers have discovered that squid ink protects white blood cell production, which ultimately gives immunity a helpful boost. Moreover, several studies have found that the ink possesses antitumor and antibacterial characteristics,” claims Carolanne Wright on Natural News. Squid ink pasta can refer to pasta with either a black squid ink sauce, or black pasta made with squid ink as one of the ingredients. For the adventurous, I have found a few recipes for you to try below. Like me, if you embark on this undertaking, I think you will be delightfully surprised. I would love to read your thoughts on Italian pasta. What is your favorite, or most unusual experience? ← Pizza Makers, Italy’s New Endangered Species? Squid ink is popular in cCtalan cooking as well. In Catalonia and since its principle city, Barcelona is on the Mediterranean coast you can get fideus al tinta, a noodle paella made with squid ink. it’ delicious. Squid ink is popular in Spanish cookinhg and even more so in Catalan cooking as well. In Catalonia and since its principle city, Barcelona is on the Mediterranean coast you can get fideus al tinta, a noodle paella made with squid ink. it’s delicious. One more thing. Several of the tapas bars in El Mercat San Josep, the large food emporium serve it as a tapa and I must say it’s awesome. Some people might not like it at first, it being squid but when you travel, you need to be open to new culinary adventures. I want the recipe for the dish in the picture!! I love squid and squid ink pasta!! I’ll see if I can dig it up for you! Squid ink pasta is on my food bucket list! Good to know you like it. Have you tried it at any restaurants in Portland, OR? I have seen it on a couple of menus, but haven’t ordered it (yet). I have not tried it in Portland…but I encourage you to be bold and go for it! I admit I don’t the word “ink” being associated with my food….ha, ha, ha….which is funny because I eat almost EVERYTHING…but there are just certain words I cannot stand, so I don’t eat the food. Yogurt is one of them….I don’t like the sound of “gurt” ha, ha, ha…so I don’t eat it……I am weird – – I know. Anyway…your meal looked beautiful! I often save the in when cleaning seppie and it is wonderful added to a risotto. along with a handful of shrimp – think black salty rice with little pink bits. Indeed, why waste the ink. Here in Melbourne, one can buy little packets of the ink from at a good fishmonger. It was a completely new concept to me….one that i am so glad I had the good pleasure of tasting:) That risotto must be colorful with the pink shrimp among the black! I might just try this one.